Hummus is a much adored dip in the foodie community. 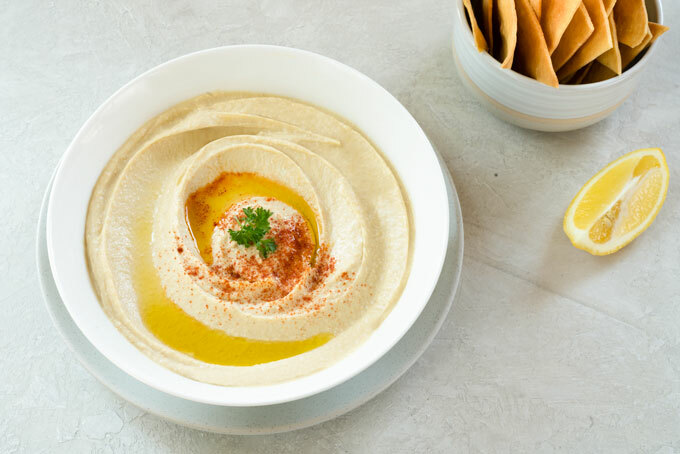 For a good reason – authentic Lebanese hummus is light, creamy, with a perfectly balanced flavor. I love it so much that I can eat it with just a spoon. BUT it’s also great with raw veggies, some pita bread, or with almost any savory food. 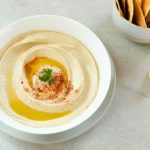 For me, hummus is something luxuriant, with a smooth, almost buttery texture, and a rich flavor pronounced by the earthiness of chickpeas, fruitiness of olive oil and brightness of fresh lemon juice. Because I love hummus so much, I used to order it almost any time I was eating out at a restaurant. But after getting disappointed too many times by a pasty and gritty, with a dull flavor hummus, I now almost exclusively make it at home. Sometimes I recall that I grew up without hummus and I’m amazed. Hummus is such a natural kid-friendly food, but it just wasn’t around where I lived. I discovered hummus when I was studying at a university, in a small cafeteria, and lived off of it during finals. It was convenient, relatively healthy, and so delicious! I could eat a whole container in a matter of a few hours if I wasn’t careful. I must have spent fortune on that stuff. So when I finished university, I started making my own hummus. It wasn’t bad, but it wasn’t spectacular either. I played around with a few recipes but just couldn’t get the texture right. So I signed up for a course called The Secrets of Middle Eastern Cuisine led by a Lebanese chef Abdel. The first time I tasted his hummus – which was sprouted, BTW – I was blown away. It was nothing like I’ve ever tasted before. Of course I learned his secret, but I’ve been a little bit hesitant to share it with you. I thought that if I did, you would never visit my site again. I could see your eyes rolling and hitting the “unsubscribe” button from my updates as soon as I wrote it. Because, you know, the difference between a mediocre, slightly grainy, and pasty hummus and the stuff that is deeply satisfying, buttery, light and fluffy, lays in peeling the chickpeas. Have you noticed how all of a sudden, everything at the health food store seems to “sprouted”? 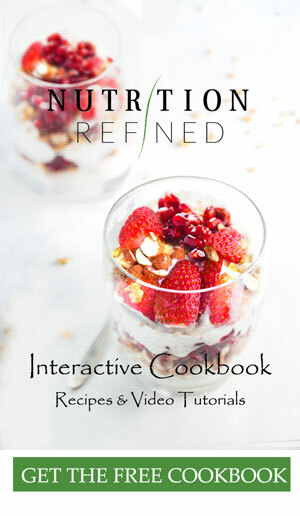 Whether that’s whole grains, legumes, nuts, seeds … sprouted foods are so popular because of their nutritional value. Sprouting magnifies vitamin and mineral content, improves the quality of carbohydrates and proteins (starches turn to simple sugars and proteins convert to free amino acids), and neutralizes anti-nutrients and enzyme inhibitors of the seed you’re sprouting. This makes sprouts very easy to digest with highly absorbable nutrients. Sprouts are also incredibly low in calories, yet deliciously filling due to their high fiber and water content. If you have never made your own sprouts, I would encourage you to read this guide to soaking and sprouting. Sprouting is like any other kitchen endeavor: it seems pretty daunting until you actually do it. I can almost guarantee that once you make hummus with sprouted chickpeas, you’ll be hooked. While tahini may play only a small role in the hummus of, say, Lebanon or Greece, some Israeli recipes call for a ratio of almost 1:1! Tahini is a sesame paste made either from raw or roasted sesame seeds. When made from the later, it is darker and has a deep flavor. I generally favor anything toasted or roasted, but here both are delicious. I usually settle for a store-bought organic version (although I’ve made my own in the past), and whip it into a creamy emulsion with fresh lemon juice, garlic, and a bit of olive oil. 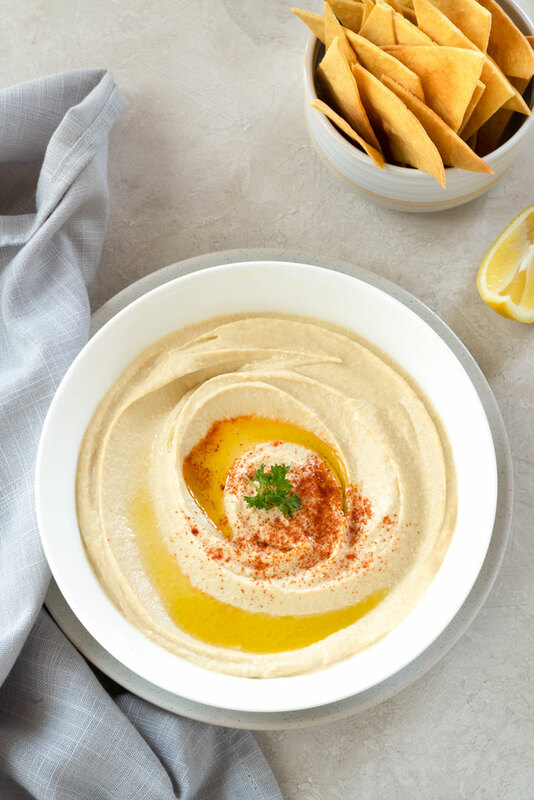 If you’ve ever shopped for hummus, you know that there are many flavors to choose from – tomato, paprika, pepper, cayenne … However, authentic Lebanese hummus only contains ground cumin and kosher salt so that’s what I stick to. You can eat sprouted chickpeas raw or cooked. Raw sprouts are “sharper” than cooked, and taste a bit grassy/earthy. This flavor profile translates to raw hummus as well. So, if you don’t like the flavor of raw sprouts, you will most likely not enjoy raw hummus either. In that case, I would recommend cooking the sprouts. If you’re intimidated by cooking dried legumes, this guide to cooking dried beans from scratch might help. While making hummus is easy, creating that ideal creamy ultra-smooth rich consistency can be pretty difficult. The main cause of grainy hummus are the translucent chickpea skins. The skins also dampen the hummus flavor, so I do take the time to pinch the skins from each chickpea. What really helps loosening the skins is soaking the chickpeas in water with a little bit of baking soda. If you’re making hummus from cooked chickpeas, adding a little bit of baking soda to the cooking liquid helps as well. The baking soda raises the pH of the water, which helps the chickpeas break down and soften more easily. But what if you absolutely don’t have time (or the energy) to peel every individual chickpea? The next best thing is to cook the chickpeas until they are literally falling apart and then blend. Obviously, this will not work for raw hummus, but it will make a huge difference in cooked hummus. When it comes to processing all the ingredients, a high-speed blender will get you a really smooth consistency. Because of their vortex action and high power, blenders can puree foods much more efficiently than food processors can. The problem is that blenders don’t work very well for pasty, viscous things like hummus. The hummus sticks to the side of the blender jar and never really comes in contact with the blade. The answer to blending chickpeas in a blender is to blend the chickpeas while they’re still hot (with some of their hot cooking liquid). When making raw hummus, I start the hummus in a food processor and finish it off in a blender. This sprouted hummus will blow you away. It's light, fluffy, and creamy with a perfectly balanced and rich flavor pronounced by the earthiness of chickpeas, fruitiness of olive oil and brightness of fresh lemon juice. Sprout the dried chickpeas (check out the sprouting guide for instructions). This will take about 3 days for small sprouts and 5 days for long sprouts. For non-sprouted hummus, you can skip this step. Cooked hummus only: Add the sprouted and rinsed chickpeas into a large saucepan, cover them with water, and add the baking soda. Bring to a boil, skimming surface as needed. Reduce the heat to medium-low, partially cover, and simmer until the chickpeas are tender and completely falling apart, 45–60 minutes. Reserve the cooking water (aquafaba). Cooked hummus only: Transfer the completely tender hot chickpeas into a blender together with some of the cooking liquid. Start the blender on low and gradually increase the speed to high. If your blender comes with a push-stick for thick purees, use it. Continue blending until completely smooth, about 2 minutes. Add the tahini, lemon juice, garlic, and olive oil, and blend until well combined. Raw hummus only: add all the ingredients into a food processor and blend until smooth, about 2 minutes. Scrape down the sides of the bowl as needed to integrate any large chunks. Once smooth, transfer the mixture into a high-speed blender and blend until ultra-smooth, adding water as necessary. Taste and adjust the seasoning, adding more salt for saltiness, lemon juice for acidity, garlic for pungency, cumin for earthiness, and tahini for bitterness. Serve hummus drizzled with olive oil, sprinkled with smoked paprika, and topped with freshly chopped parsley. Store leftover hummus covered in the refrigerator for 5-7 days. For longer term storage, freeze in an airtight container for up to 3 months. *1 cup dried chickpeas equals about 2.5 cups soaked chickpeas. **I make raw sprouted hummus that same as cooked sprouted hummus, except I add extra of everything to balance the flavors. **Prep time does not include sprouting the chickpeas (about 3 days). can I use the sesame seed instead the tahini? That hummus is soooo tasty! I’ve never tried this dish before and I was curious about the taste and result. So, I can say that it is something very exceptional for me and so,so great! I like it! I ate it on its own as a dish. 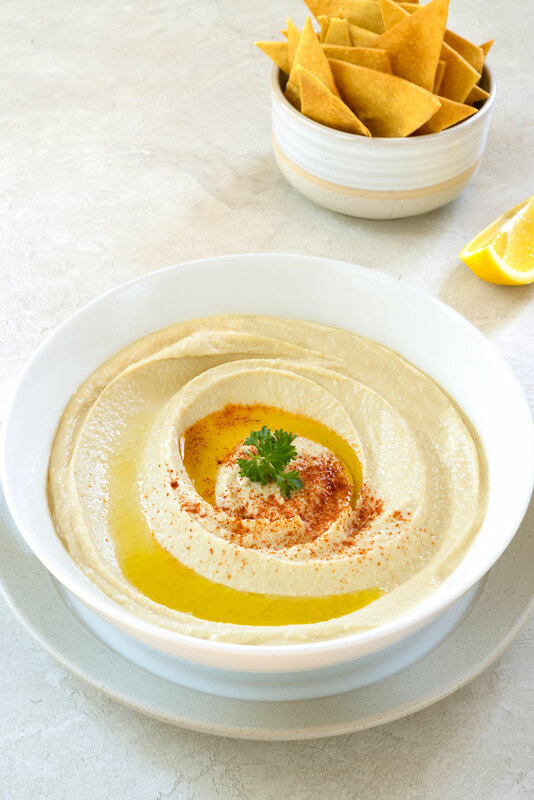 That hummus is​ a superior idea for a healthy choice to eating​ and it’s something new to try! I​ like the fact that I ate it and did’t feel heavy after it. I mean it’s very light for digestion but at the same time you don’t feel hungry after eating it! The proportions are very good and I did it exactly as it’s said in the recipe. Our family loves hummus so much! We always (and I mean – ALWAYS) have hummus in the fridge. My 4-year old alone can eat a whole batch in just a couple of days, so I make at least 4 batches during the week 🙂 So happy you enjoyed it! Oh, really your 4-year old child eats Hummus? I’m glad to hear it! Because nowadays children do not want to eat healthy food and dishes (especially with the taste of garlic) and they usually prefer sweets and other unhealthy food. Thank you for your respond, Petra! I agree with you, it’s impossible to control what our kids eat outside, when they are with other kids and generally in their future life. What we can do – it’s to try to feed them nutrition-rich food as you do at home, explain them about the healthiness of that food and hope that one day the will make their own decision to eat healthy food. We cannot control all people and even our own children. Even I have to eat not so healthy food when I’m on holiday because it’s not always possible to find exactly what I like and what I prefer to eat for my health. Therefore, I have to adjust to food when I’m on holiday or when I’m a guest in my friend’s home etc. I think we have to try to eat healthy as much as we can, but sometimes not to be very strict and of course have positive thinking about what we do and what we eat at the certain time in our life. Have a good day, Petra!!! So do I !! Not for my kids (because I don’t have them yet) but for me and my husband! From the day I met you and your great recipes in your channel I prepare healthy snacks with me for travell by airplane, by car and I’m so happy to be able to snack something nutrition-rich and healthy on the road! I’m not obliged anymore to buy ready fast food which I didn’t like ever and which is not usually healthy prepared. Here in Cyprus where we have been living for the last 6 years we love to go for walking to different trails on the mountains and other trails. The best hummus-recipe I ever tried/made!!! And I tried a lot in the past… I made it without the garlic, because I dont like it raw, but other than that I followed your recipe (+ the sprouting-part) and it was/is fantastic! So smooth… and well balanced! Thank you for sharing this great recipe! PS: I discarded the skin of the chickpeas. I dont know if that makes it so smooth or the sprouting – but it is as a whole just the perfect hummus recipe! I cant wait to try a lot more recipes from your recipe-archiv! Once again: thank you! Is it possible to freeze the sprouted chickpeas to use in a future batch of hummus? I’m wondering if it would be good to sprout a large batch and then freeze whatever amount of chickpeas isn’t needed for the current hummus recipe. Also, have you ever made hummus using something other than chickpeas as the base? Hi Debbie – I always store my sprouts in the refrigerator. When properly stored, they last 6 weeks!! Here is how I store my sprouts: I let my sprouts sit for 8-12 hours after their final rinse. I make sure they are thoroughly drained. (There is no quicker way to kill produce than to refrigerate it wet). Once thoroughly dry, I transfer the sprouts into a glass (air-tight) container. I don’t let my sprouts “breathe” because that just dries them out. However, if your sprouts are wetter than you think they should be, you might wanna store them in a breathable produce bag (the air won’t hurt in that case and it may help a lot. Once they are cool and dry you can seal them in a container). While you can freeze sprouts, there are disadvantages. IF you’re planning on eating the sprouts raw, I do have to warn you that frozen sprouts do lose their crunch (they go kind of soggy), which is not a problem if you’re using them to make hummus. YES! I often make “hummus-like” dips without chickpeas. I have tried red lentils, yellow lentils, split peas, roasted sweet potatoes … delicious! Are some of your alternate hummus recipes in your recipe listings? Or do you substitute equal amounts of an alternate to the chickpeas? Thanks Petra. I always enjoy your recipes and videos. HI Debbie – to be honest, when I cook at home, I don’t measure anything. I go by taste (which is not very helpful, I know). If you want to make hummus using other legumes (lentils, split peas …), I would use the same amount of ingredients as if you were making chickpea hummus, taste, and adjust the flavor from there. If you wanted to add sweet potatoes to the chickpeas, you will most likely need to use more of everything (tahini, lemon juice, salt) because sweet potatoes have a flavor on their own. Another version I’ve tried is using just green peas (instead of chickpeas). The flavor is light and refreshing … oh and one more version I have to share (because it’s my daughter’s favorite) is using the standard hummus recipe, but adding a roasted red bell pepper to the mix. It’s delicious! It sounds like hummus can be a great adventure. Thanks for all the great ideas!